The Church Fathers where truly holy, wise and perfect men, who fighting bravely trampled the world underfoot, fed their flocks in a world of hunger, and defended the Church against the attacks of heretical wolves through their faithfulness to apostolic tradition. Today a man is considered learned to be versed in a little of their wisdom, and Holy if he follows their basic maxims. 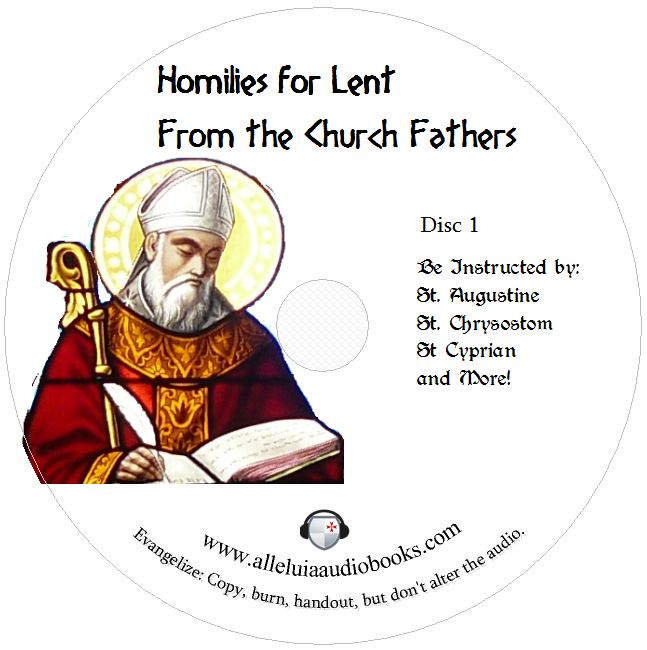 Prepare for Easter this Lent by listening to one Homily from the works of Holy Church Fathers every day in this multi volume set of their homilies prepared for everyday of Lent. True Penitence by St. Cyprian. Worldly Cares by St. Chrysostom. The Temptation of Christ commentary from the Catena Aurea. Vain Glory by St. Augustine. Rejoicing Always by St. Chrysostom. Esteeming God More than Man by St. Chrysostom. The Good Use of Time by St. Chrysostom.